A short biography of Maria Roda, a fierce champion of women's liberation and anarchism, active in Italy, France and the United States. “Maria Rodda (sic) was the most exquisite creature I have ever seen. She was of medium height, and her well-shaped head, covered with black curls, rested like a lily of the valley on her slender neck. Her face was pale, her lips coral-red. Particularly striking were her eyes: large black coals fired by an inner light…Maria proved a veritable ray of sunlight to me”. Living My Life. Emma Goldman. Maria Roda was born in the town of Como in the Lombardy region of Italy in 1877, the daughter of Cesare Balzarini Roda and Monti Luigia. She learned silk weaving from her father, who was a textile worker and militant anarchist, one of the most active in Como. She found work as a teenager in the local mills. Her father’s house was a meeting place for local comrades or anarchists just passing through, recorded the police who had it under surveillance. Cesare had encouraged his four daughters to interest themselves in the ideals of anarchism, and they sang anarchist songs as they walked on the streets. The family eventually moved to Milan, a city that offered better wages and employment opportunities. Though only in her teens she was fined and imprisoned for a period of three months for her activity during a strike she had helped organise in the mill where she worked. The French anarchist Zo d’Axa on the run from the French authorities wrote about the trial of the young anarchist girls Ernesta Quartirola aged fourteen and Maria aged fifteen saying that they had incited the demonstrators to attack the police. Maria said in court in reply to the court: “I pity this guard. I pity him because he barely earns his bread, because he’s a poor devil. But it impresses me to see him go after other poor devils, his brothers...let him think about this.” They each received three months imprisonment for this as well as heavy fines. Zo remarked: “It is said over and over that Milan is a little Paris. The magistrates of Milan prove this, at least on one point; they are every bit as repugnant as their Parisian confreres”. In Milan Maria met Errico Malatesta at an anarchist congress, as well as the Spanish Catalan anarchist Pedro Esteve, who was later to be her life long companion. At some point Maria moved to France. There she was arrested along with other members of an anarchist group, following the assassination of President Sadi Carnot of France by one of the group’s members, Sante Caserio. Maria had gone to school with Caserio where both had been taught by the fiery socialist poet Ada Negri. On her release she eventually immigrated to the United States with her father and a younger sister in 1892 after stays in Portugal and England. She and her father joined the Gruppo Diritto all’Esistenza which included Maria Barbieri and other Italian anarchist immigrants. She began to organise textile workers in Paterson. Emma Goldman heard her speak alongside Voltairine de Cleyre and the English anarchist Charles Mowbray at a meeting set up to welcome Goldman home following her release from Blackwell’s Island. Roda addressed the Italian comrades present in the hall to welcome Emma home after her term of imprisonment. A skilled orator and organizer she also wrote for La Questione Sociale, organ of the Paterson group. 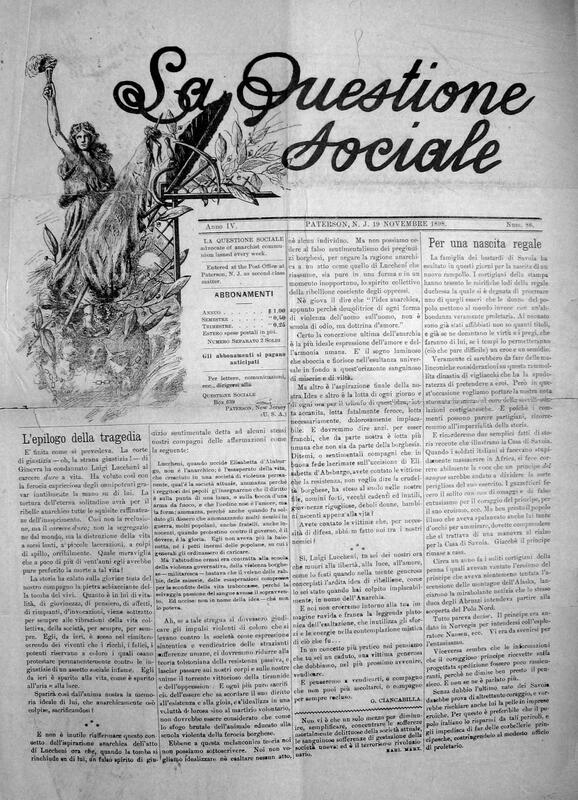 Maria helped found a gruppo anarchico feminile (anarchist women’s group) called the Gruppo Emancipazione della Donna (Women’s Emancipation Group) in 1897. Announcing that women were meeting separately in La Question Sociale she wrote “and it is right because we feel and suffer; we too want to immerse ourselves in the struggle against this society, because we too feel from birth, the need to be free, to be equal”. It had connections with French feminists through a journal called Feminist Action started by Louise Réville. Over the next decade into the early 1900s the group established links with a similar woman’s group in New York City and established a network with other women workers throughout the States and internationally. This included in Philadelphia and Boston and among the mining communities of Pennsylvania, Illinois and Vermont. They discussed and wrote about the specific problems and struggles of women whilst uniting with men in the common struggle of the workers’ movement and the anarchist movement. Italian anarchist women formed one of the first locals of the Industrial Workers of the World in Paterson. Maria moved in with Pedro Esteve who along with the Italian Pietro Gori had established La Questione Sociale. While raising eight children and working in the silk mills, Maria and Pedro became leading lights within the anarchist and workers movement in Paterson. Maria and Pedro regularly went to Tampa and New York City to help the struggles of Puerto Rican, Mexican, Cuban, Spanish, and Italian textile, cigar, and dock workers. According to her son Sirio she turned to Rosicrucianism in later years. Interesting stuff, keep them coming!